Did you know that the principals of A2Z have been teamed in different product development activities for over 30 years? A2Z Technologies Corporation was founded in 1997 and focused on the development of customized instrumentation for primarily Government customers, mainly through the Small Business Innovative Research (SBIR) Program. A2Z Optics Corporation was formed in 1998 as a commercial spin-off and focused on the commercial development of an optics engine for multiple commercial applications (both Government and Commercial). In 2005, the entire business division for this product was purchased by an outside venture. A2Z Innovations, Inc. was formed in 2003 to help small companies bring products to market. We partner with companies/entrepreneurs that have may access to a market, but are having difficulty developing a breadboard, prototype or production-ready product or system. Under certain conditions, A2Z Innovations can perform product development services on a product-equity basis. Our mission at A2Z is to provide the skills, knowledge, and experience necessary to transition feasible concepts to marketable products and to new business opportunities for our clients. Our Experience: Over 28 years experience in new product development. For over 30 years, the principals of A2Z Innovations, Inc. have been developing new products and launching new businesses that cover the spectrum in technologies, applications, and customer bases. From high-tech, to low-tech, to no-tech, the key element in all successful development efforts has been the assembly of the right team with the experience for market launch. Since 1986, Michael C. Zari has been at the forefront of new product development; teaming with customers and clients in both the commercial and Government arenas. Having achieved many product successes over the years, he has valuable experience in all aspects of product development: from concept, to production, and the processes in between (i.e. design/engineering, prototyping, testing, product management, marketing, etc.). With a Masters Degree in Electrical Engineering and a forte in all aspects of new/commercial product and business development, Michael has authored many papers and articles in the technical and scientific community, is an international presenter and speaker, and is a co-inventor on numerous patents and applications. His talents and organization are a great asset to rapid product development, commercialization and for new business development efforts alike. A2Z Innovations, Inc. is located in Madison, AL, which neighbors Huntsville, AL, "America's Space Capitol." The Huntsville area remains one of the South's fastest-growing. The population of the Huntsville, AL MSA is estimated at over 455,000 (an increase of ~ 22% in the past 10 years), and it has one of the highest per capita incomes in the Southeast. 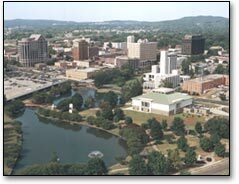 Huntsville is also the 2nd largest city in Alabama. The metro-Huntsville area is home to more than 50 Fortune 500 companies and is best known for its heritage in the military and aerospace industries.